Trail running is a sport-activity which combines running, and, where there are steep gradients, hiking, that is run "on any unpaved surface". It is similar to both mountain and fell running (also known as hill running). Mountain running may, however, include paved sections. Trail running normally takes place on good paths, or tracks which are relatively easy to follow, and does not necessarily involve the significant amounts of ascent, or need for navigating skills, normal in fell running. Unlike road running and track running it generally takes place on hiking trails, often in mountainous terrain, where there can be much larger ascents and descents. It is difficult to definitively distinguish trail running from cross country running. In general, however, cross country is an IAAF-governed discipline that is typically raced over shorter distances. The number of organized trail races has grown over the past few years[when?] throughout the world. Runners often cite less impact stress compared to road running, as well as the landscape and non-urban environment, as primary reasons for preferring trail running. This move to nature is also reflected in a large increase in competitors in non-traditional/off-road triathlons and adventure racing in the 2010s. A growing number of people are participating in solo backcountry trail running trips, carrying an ultralight form of backpacking to allow faster speeds than with a traditional backpack. Running while backpacking has been termed "fastpacking". These trips can be both difficult and dangerous, depending on length, weather and terrain. Mountain and fell running (also called hill running, particularly in Scotland)  are sports that combine running and racing off-road over upland country, where the gradient climbed is a significant component. Fell is a dialect word from the north west of England where it is popular–especially in the Lake District. Fell races require mountain navigation skills and participants carry survival equipment  Unlike trail running, the routes of fell races are often unmarked, so that competitors frequently are able to choose their own route to a checkpoint. The only difference between mountain running and trail running is that a mountain running course sometimes includes paving. It is different from fell running because, (1) courses are clearly marked and avoid dangerous sections; and (2) while mountain running takes place mainly off-road, if there is significant elevation gain on the route, surfaced roads may be used. According to a 2010 special report on trail running published by the Outdoor Industry Foundation, "4.8 million Americans ages 6 and older participated in trail running in 2009." This research shows a particularly heavy following in the Mountain States, the Western US, and California. Because of the natural or serene setting, trail running is viewed as a more spiritual activity than roadside running or jogging. Another reason for growth and popularity is the continual acknowledgment of environmentalism. There is a stress among many trail-race organizers to keep these races "green" or environmentally friendly and minimize disturbance within the natural environment. Trail running shoes now come in a wide array of styles. Many trail running shoes feature specialized materials and out-sole patterns that are designed for use on specific types of terrain. Many trail runners use specially designed shoes that have aggressively knobby soles that are generally more rigid than road running shoes. The usually EVA compound midsole often contain a lightweight, flexible nylon plastic layer to protect the feet from puncture wounds from sharp rocks or other objects. Since trail running takes place on softer surfaces (e.g., grass, dirt) than road races, cushioning is not as important so often the shoes are less 'cushioned' than their counterparts designed for tarmac. Additionally, trail running shoes are low to the ground which provides the best stability on uneven terrain. Recently, very thick sole running shoes are gaining popularity especially in Ultra-marathons. In events over 100 miles, they were the most common type of shoe used in 2013. Other equipment includes wicking garments, water bottles, sunscreen, sunglasses, gaiters, insect repellent spray, headlamps and ivy block. Some trail runners attach lightweight crampons to the bottom of their shoes to aid with traction in the snow and on ice. An alternative way to carry water is use a hydration bladder with drinking tube carried in a backpack or waistpack. Today, there are many racing vests that are lightweight alternative which allow runners the choice of reservoir based bladder or water bottles while allowing for carrying other items such as nutrition, hydration supplements and cold weather gear. Carrying the Ten Essentials may reduce the hazards inherent in wilderness travel. Some trail runners use ultra light hiking poles (which are often not allowed during competition) to increase speed and stability. Trail running races are organised globally. Due to the relatively short history of trail running as an organised sport, there are very few established organizing bodies. For example, in the United States, the American Trail Running Association was only founded in 1996 to represent trail races in the US. In the United Kingdom, the Trail Running Association was formed in 1991. The International Trail Running Association (ITRA) was founded in 2013, and was first recognized by the IAAF in 2015. Distances in races vary widely, from 5 km, to over 100 miles (161 km). Many trail races are of ultramarathon (ultra) distance. Ultras are generally accepted as having a distance of greater than 26.2 miles (42.16 km) though 50 km races are the most common 'standard' ultra distance greater than a marathon Races of similar distance often differ significantly in terms of terrain. This makes it difficult to compare performance across different courses. This is in contrast to times over standard distances in road running, such as 10 km or marathon. Aid stations supplying food and beverages are commonly located every 5 to 10 kilometers along the course. Ultramarathon aid stations are often stocked with dessert foods that provide runners with quickly digestible sugars that can provide a needed boost as their glycogen levels begin to drop. Most trail races only have a single stage, where competitors are timed over the entire duration of their run, including stops at aid stations. However, trail running stage races also exist. These multiday stage races usually offer complete support and runner amenities between stages. There are, however, stage races that provide no support apart from water and medical aid, and require competitors to carry all their equipment (food, sleeping bag, change of clothes, compass). The best-known example of such races is the Marathon des Sables, that was first held in 1986. Compared to road races, there are often fewer participants as number of entries is often limited. There can be a few reasons for this: narrowness of trails, national parks (where the courses are often set) may limit the number of participants via a permitting process, safety and environmental concerns. There are many popular races such as the Ultra-Trail du Mont-Blanc in Europe or the Western States Endurance Run in the United States that have been forced to limit entries due to overwhelming demand. ^ Lisa Jhung. "What Is Mountain Running? Runners World 13 February 2014. ^ a b c "Trail Running or Fell Running?". fellrunningguide.co.uk. 11 October 2013. Retrieved 8 March 2019. ^ "Global Ultramarathon Races & Events Calendar". ULTRAmarathonRunning.com. Retrieved 25 March 2015. ^ Jhung, Lisa. "Why Trail Running Is Good for You". runnersworld.com. Retrieved 27 June 2017. ^ "Outdoor Participation Report 2013" (PDF). Outdoor Foundation. Archived from the original (PDF) on 24 September 2015. Retrieved 25 March 2015. ^ Kate Siber, "Fastpacking: What is it, and why do it?" Runner's World, August 6, 2009. ^ Clint Cherepa, "Hike Fast, Sleep Hard: Are You Ready to Try Fastpacking?" Outdoors.org, August 27, 2018. ^ "An introduction to hill running - runbritain". Retrieved 10 October 2016. ^ "IAAF Competition Rules 2016-2017, rule 251". Retrieved 4 October 2017. ^ "A Special Report on Trail Running". Outdoor Industry Foundation. 2010. Retrieved 2010-07-09. ^ Farago, Susan. "From the Growth of Trail Running to Environmentalism". Austin Fit Magazine. Retrieved 3 December 2013. ^ "What to look for in a running backpack". Cause I Love Running. Jessica Natalie. Retrieved 10 October 2016. ^ "ATRA history". American Trail Ruunning Association. Retrieved 2012-08-25. ^ "Presentation and objectives". International Trail Running Association. Retrieved 18 April 2016. ^ "Home". Persian Trail Runners. Retrieved 2019-01-30. ^ "2018 Five Peaks Ultramarathon & SA Trail Running Festival". trailrunningsa.com. Retrieved 8 March 2019. 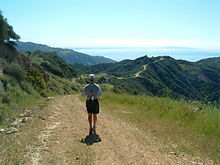 Wikimedia Commons has media related to Trail running. This page was last edited on 24 March 2019, at 15:58 (UTC).